A contract is an agreement between parties that sets out their respective rights and obligations for the period that the agreement is in existence. There are certain elements that all contracts should have in order to be valid and legally binding. However, not all contracts are in writing and under English law there are a variety of contracts that can be made without being reduced to writing (for example, buying a newspaper from a stand outside a station.) Reading a legal document can be daunting but there are certain elements which are required to make a contract legally binding. 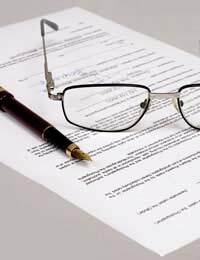 This is in essence the distinguishing feature between a deed and a contract. In an agreement with two parties, both must provide ‘consideration’. In other words, both must contribute something within the contract. Sometimes, consideration can be nominal (e.g. a business which has considerable debts may be sold for the nominal value of £1). In general, a contractual relationship will not have been formed unless there has been a offer specified by one party that has been accepted by the other. Partial acceptance is not sufficient, and will usually constitute a counter offer. Any counter offers will need to be agreed before the contract can be formed. Any ambiguity in the important terms of a contract is likely to make it unenforceable. For example, you cannot agree a contract of sale if there is no clearly defined price. There should also not be any question that either party has been forced or pressured into making the contract, and the subject matter of the contract should not be illegal. For example, if A contracts with B to commit a criminal act, this is not legally binding. There are certain questions you should ask yourself when reading through a contract. Look through the rights and obligations of both parties. Is everything that you have agreed included, and is there anything that you didn’t agree to? Is the price, or other ‘consideration’ clearly spelt out? You must be able to establish the conditions for ending the contract too. Is there a notice period for terminating the contract? Does notice have to be given in writing? What happens if one party breaches the contract? Are there any clauses that look like a party is trying to avoid being liable for something? What are the procedures in case of a dispute? This can be important in relation to jurisdiction. If a dispute needs to be resolved in the courts, it will be much more expensive to sue abroad than if the agreement is governed by UK law. Make sure that you understand everything that is required of you before you sign. If you are in any doubt, seek legal advice.